Last night at 6pm, I left the car parked overlooking the gleaming sea off Scotland’s north coast. This morning at 8am, I started walking from my tent, pitched in a sheltered spot in the foothills. And now? It’s noon on this fair summer’s day, and I’m taking one of my regular food-water-map breaks. But I think I’ll sit a little longer than usual on this particular lump of granite and review my progress. This journey really started when I read about the visit to Lotte Glob’s studio that Ruth Hedges and Luke Watson made for the last issue of MAP. Glob has made use of the huge resource that the north-west Highlands represent, referring to it as The Ultimate Rock Garden . A photograph in the feature shows a Glob creation, sitting on a rocky outcrop way above the end of a loch. A quick look at an Ordnance Survey map seemed to confirm my suspicion that this was a view of the end of Loch Eriboll where Glob lives. But I was wrong about that, because when a booklet called The Ultimate Rock Garden arrived on my desk, a rough location for the piece was given—by An Teallach, 60 miles to the south of Eriboll. So the stretch of water in the photograph is of an east-west-running inland loch, not a north-south running sea-loch! I realised that such a conjunction of foreground crag, loch-fed-by-meandering-river and distant hills is a generic scene in the Highlands. 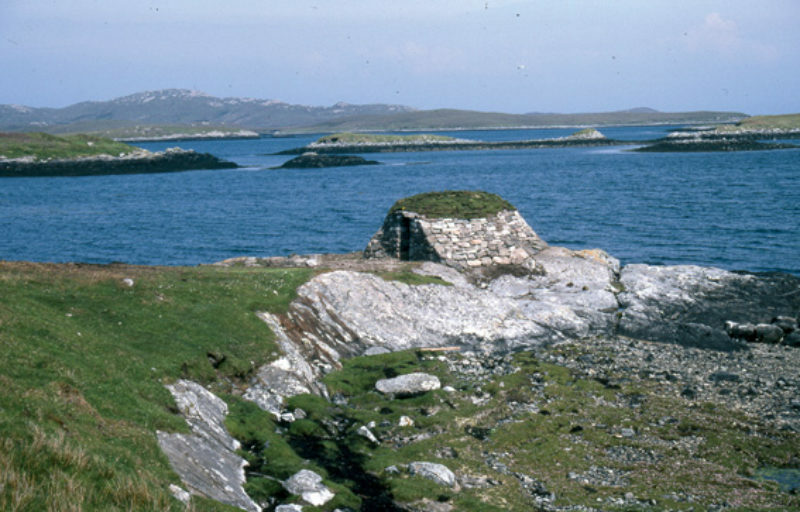 The booklet contained a tiny diagram showing the rough location of Glob’s ‘pot spots’, and I counted a line of six that appeared to be in the range of hills to the west of Loch Eriboll. That’s where I am now, not so much hoping to come across the pots—though I am peering through binoculars from time to time—as hoping to get something out of the wider search process. I listen to the plaintive calls of a pair of golden plovers whose heather-and-bog nesting territory I’m trespassing in, and I decide to walk on. While I’m still relatively fresh, I want to go into the parallel story of the Richard Long work that Bill Drummond bought from the Anthony d’Offay Gallery in London in 1995. ‘A Smell of Sulphur in the Wind’ is a photograph of a stone circle made by Long as he passed through a barren Icelandic landscape. Drummond thought he recognised the precise place from a journey he had made himself as a youth, and this partly motivated the decision to make the purchase for $20,000. A few years later, Drummond realised he was not only bored with the photograph but unhappy with the transaction he’d entered into. 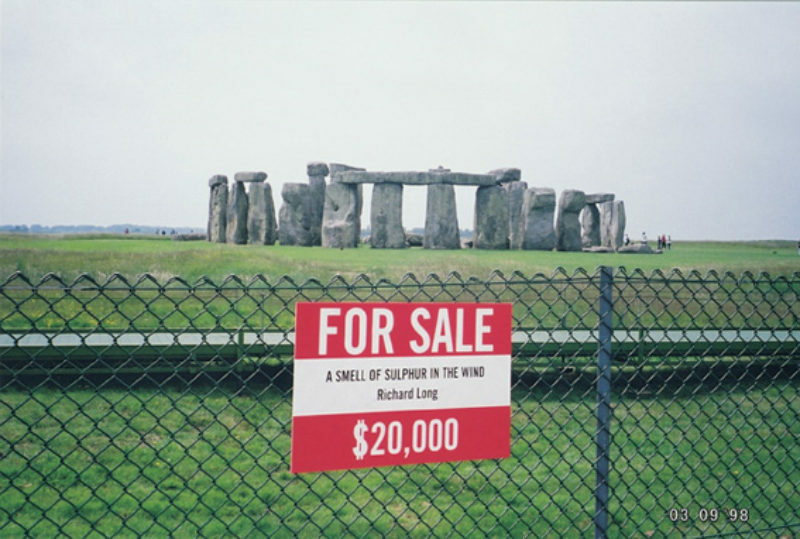 So he made 500 placards stating that the Richard Long work was for sale at its original cost, and placed the placards by the roadside as he made a journey from the south coast of England to the north coast of Scotland. The book he made about the journey, HOW TO BE AN ARTIST, juxtaposes photographs of the placards in situ with a narrative. This explained that Drummond’s intention was to sell the Long photograph, go back to Iceland, find the stone circle, bury the $20,000 in the middle of the circle and take a new photograph. ‘A Smell of Money Underground’ was to be the title of this prospective piece. But will it ever happen? Bill Drummond, like me, could be a victim of generic scene syndrome—he might never find that stone circle in the huge wilderness that is Iceland. A more immediate possibility is that he will never raise the money to even try. By the end of HOW TO BE AN ARTIST, Drummond had decided not to attempt to sell the photograph to a single buyer, but had divided it up into a grid of 20,000 squares which he would try and sell at a dollar a time. He would go round the country telling his story at art venues, ending each performance by cutting up a bit more of the photograph and exchanging the fragments for small sums of money. And that’s what he has been doing. Seven thousand dollars has so far been raised in this way, so the prospect of the return journey to Iceland is still on the cards. Indeed I’m sure that it will happen when the time feels right for Bill, whose work—ever since he found himself unable to burn a weekly wage cheque – has been about refusing to put a monetary value on life. Never more so than when he and his partner in the K Foundation burned a million quid on an island off the west coast of Scotland. The ultimate rock artist’s grand gesture, I thought at the time. I don’t think that now, though. I stop again. I’m at a group of three lochans, which could be fertile Glob territory. 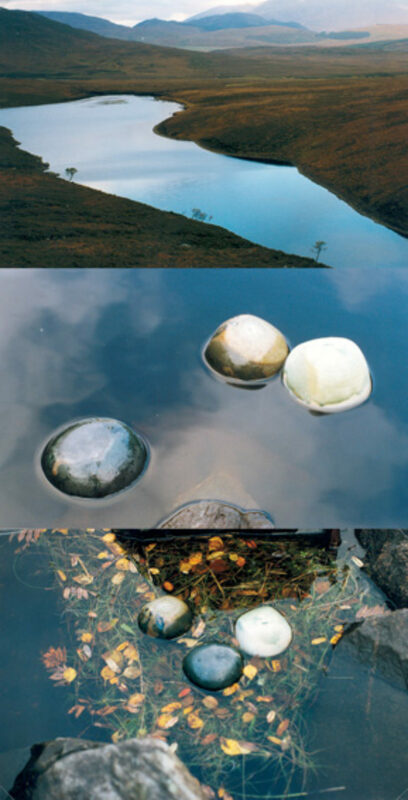 For, as well as 70-odd pot spots within 5000 square acres of Highlands, Lotte has positioned a set of three ‘globulites’—floating ceramic stones that she makes—in over 100 small lochs in the area. I quickly scan the lochans, but to no avail. Last night I had a long look around Loch Duail, close to my tent. I found plenty of black slugs and white cotton along the shore, but no floating stones. I thought it through: the sky rains, the water level rises, freeing the stones from their original semi-secure positions, and then a strong wind birls the stones across the loch to position B. Sooner or later position X would be the outlet of the loch, and down the stones would float to the next level. By my calculations, all Lotte’s globulites are in the sea by now. Beachcombers at Balnakeil Bay—where Glob first used a long row of floating stones to meet an incoming tide—should be putting themselves on orange alert. In short, it’s not a surprise to me that there are no stones in these lochans, just a pair of black-throated divers that don’t seem to mind my presence. I’m walking on a field of ankle-testing rocks, while the problem up until now on today’s walk has been keeping my feet from getting wet in the bog. But in any case, I must try and keep thinking. Lotte Glob told me that she has come across a Richard Long stone circle in these hills, only finding out what it was when she obtained Walking in Circles, a book that Bill Drummond has mentioned respectfully. Yes, Long has repeatedly walked these Highland hills, but the place he’s criss-crossed and circled most often is Dartmoor, not far from his Bristol base. The photographs and text works recording walks across Dartmoor over 30 years surely add up to a body of work that’s fascinating in itself. Hamish Fulton, also a graduate of a London art school in the late 60s, is based in Kent but has also made quite a few trips to the Highlands. He makes a point of not interfering with the landscape on his walks, so Glob wouldn’t know if her hikes in the hills have overlapped his. Actually, although the record of Fulton’s walks should make for a body of work as compelling as Long’s, over the years he’s been seduced by advances in computer software into making more and more sophisticated wall drawings. Long has stuck to the same simple fonts, enabling works from different stages in his career to co-exist beside each other more easily, adding a classic dimension to texts and photographs that ostensibly salute a specific time and place. This point came to mind when I was comparing a text work of a walk made by Long from the north to the south coast of Spain in 1990 (a road walk of 622 miles in 21 days, from Ribadesella to Malaga), and a wall-drawing made by Fulton in 2003 recording a walk in the opposite direction. The basic information given was almost exactly the same, but the Fulton image was decorated by superficial graphics, taking the edge off it. When I raised the subject of land artists who work in the Highlands with Lotte Glob, I was hoping she would have some new names for me, perhaps even Scottish ones. But the only other practitioner she came up with was another cosmopolitan artist, originally from England, whom I already knew about, Chris Drury. As with the work of Long, she came across a structure of Drury’s in the mountains, and only realised whose handiwork it must be in retrospect and via a book. Unlike Glob and Long, Drury positively encourages viewers to seek out his work. For instance, his website will not only give you a grid reference for the ‘Cloud Chamber’ he built on North Uist in 1998, it gives you details of how to get there and the telephone number of a bloke who might be able to help, should you have a problem gaining access. But then that is a different sort of work, one that can’t be put across in a photograph, so of course the artist is going to encourage people to visit the actual site. My mind is wandering. The going has been uphill, which is bad for sustaining a train of thought. But I’ve reached the summit, Carn an Righ, from where I have a magnificent view all around as I stuff cheese and water into my mouth. From here I can see Lotte Glob’s home on the shore of striking Loch Eriboll, and this reminds me that I may be in the mountains, but I’m still in her back garden. I try to make myself feel as at home as she would, and I extract the one luxury item I’ve brought with me on my journey. It’s a Thames and Hudson book, and it’s a luxury because it weighs a country ton. Song of the Earth is subtitled ‘European Artists and the Landscape’, and is written by Mel Gooding and William Furlong. Richard Long and Chris Drury are two of the featured artists, and so is the Dutchman herman de vries (always lower-case). 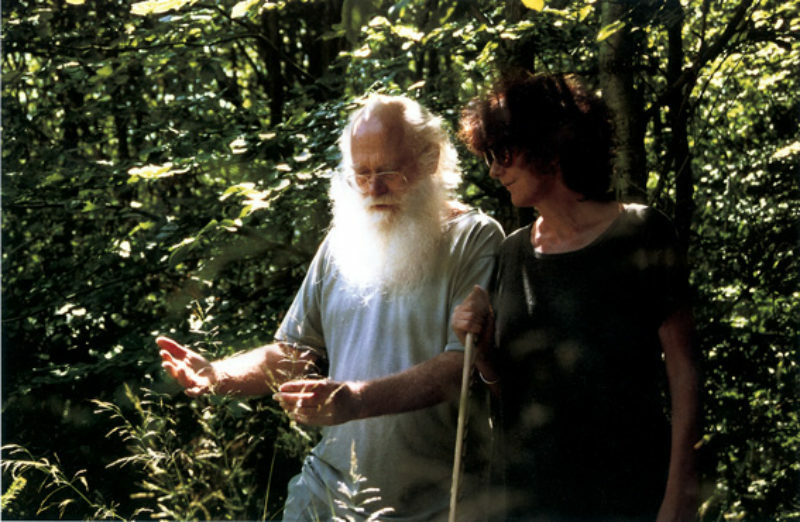 Like Lotte Glob, de vries has lived close to nature for 35 years. Not in the mountains, though. Rather, de vries lives beside a forest in where he finds material and inspiration for his work and his philosophy. Energy returns to my body. Hope surges through my mind. Free of my back-pack and the heavy book, I walk around the cairn trying not to break my ankle while looking for pots. My new idea is to find a pot, put my fee for writing this piece into it, and bury the pot in the middle of the stone circle in Iceland, thus bringing the contrasting works and values of Richard Long, Bill Drummond, Lotte Glob and myself into stark relief. Trouble is, I can’t find a Glob-U-Like. Ha!—the world is my pot! I see it every day, I drink from it every day, I piss in it every day. Great stuff! But I am never going to remember my very own ‘Song of the Earth’ by the time I have trudged all the way back to the tent, never mind my study. What I manage to commit to computer screen will be but a pale shadow of the exhilaration I feel now. Ah, well, it’s a hard life being a land artist.